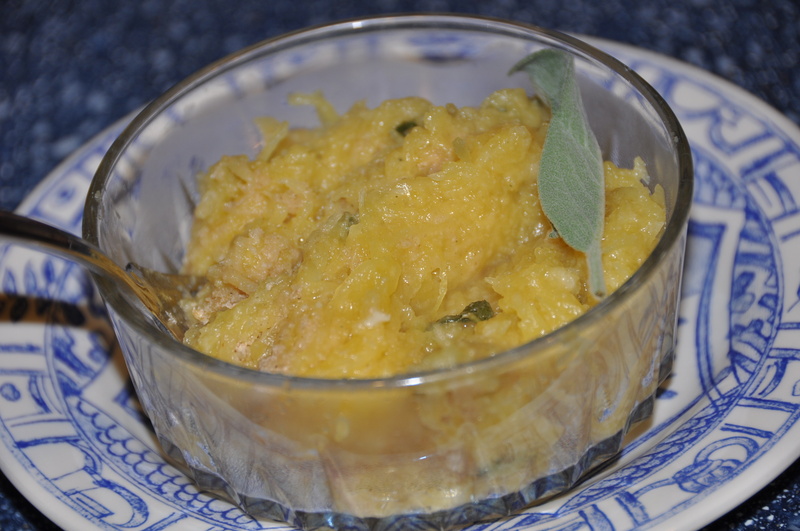 “Spaghetti squash” is one of my most searched words when someone stumbles upon my blog. I have a great recipe for spaghetti squash cakes that is out of this world. So I’ve been on the lookout for more. Luckily, in the Jan/Feb issue of Everyday FOOD magazine, spaghetti squash was the hi-light veggie. Unfortunately, none of the recipes were vegan. So what? I can transform any recipe into a vegan one right before your eyes! My altered vegan recipe is the main print. Original is in blue. You can certainly mix and match for your comfort level! 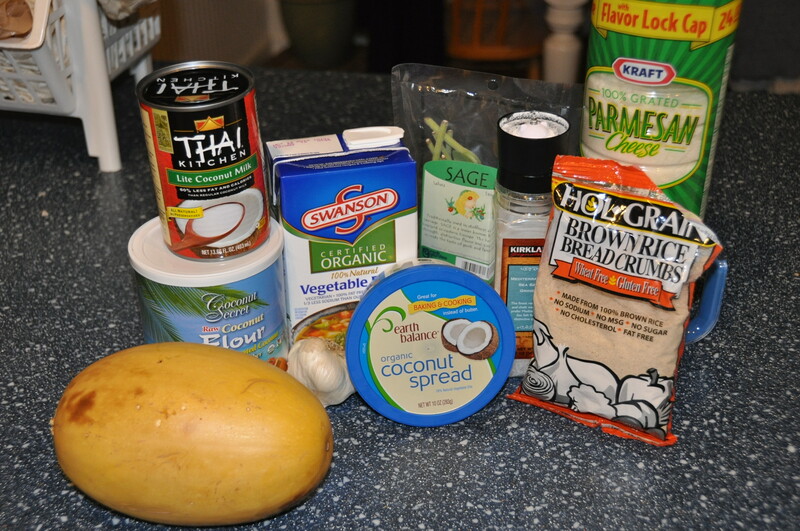 You can mix and match some of these ingredients if it's looking a bit foreign. I used two of this sized squash. 1. 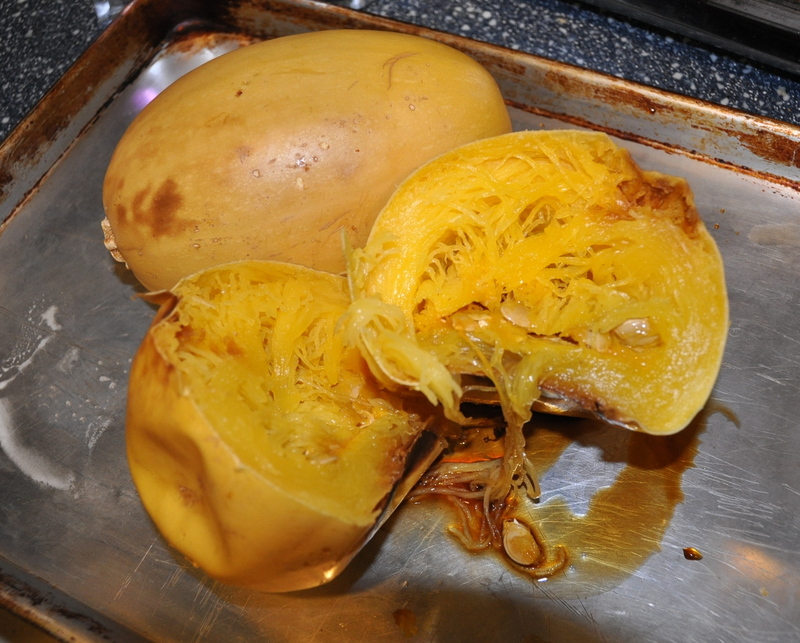 Roast spaghetti squash by placing on a baking pan, stabbing with a fork several times and baking at 350 degrees F for 1 hour 15 minutes. Slice open and remove seeds. The flesh will come out with a fork like spaghetti (hence the name) This can be done ahead of time and refrigerated for 1 day. Don't you love the deep, rich golden color? 3. In a small pot bring broth, milk and garlic to a boil over medium -high and cook 1 minute. 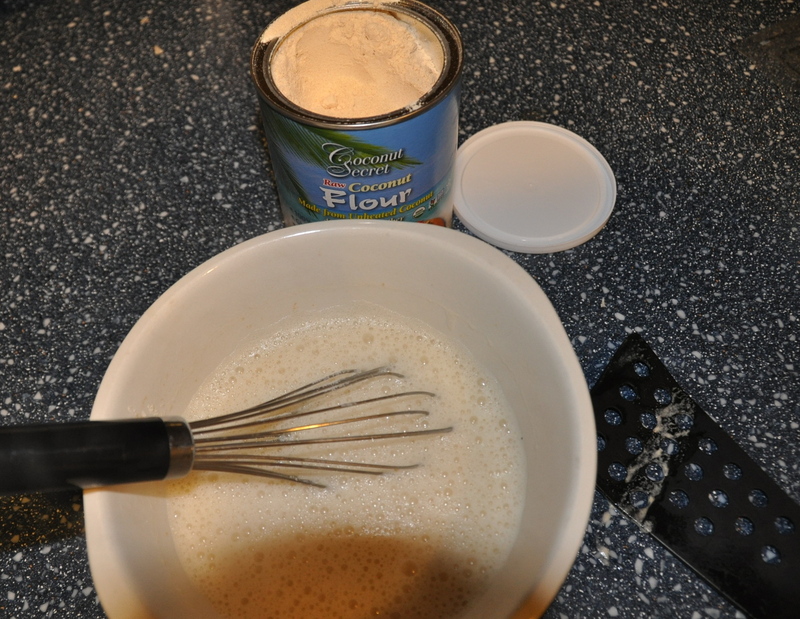 Pour into a medium bowl and whisk in flour until well combined. 4. 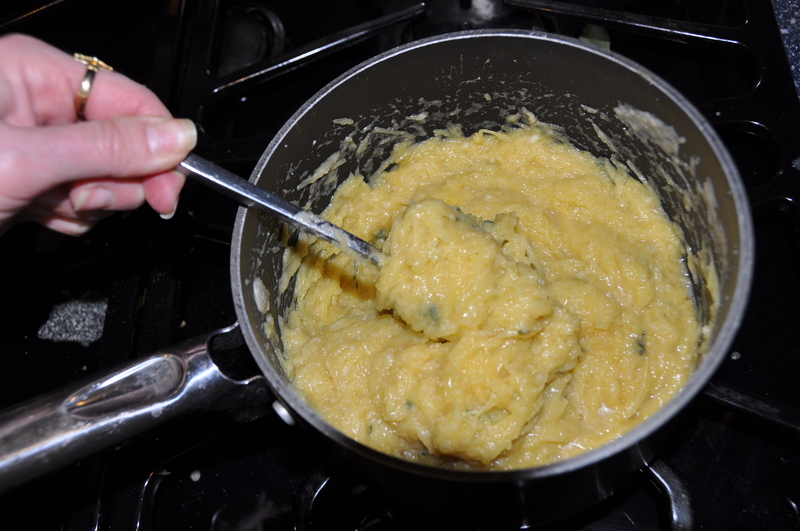 In the pot, melt coconut spread (butter)and 2 tsp of sage and cook stirring 1 minute. Return broth mixture to pan and simmer until thickened (about 6 minutes) about 12 minutes. Cows milk version will thicken faster than coconut milk. The coconut flour won’t get very thick on the stove, but will thicken more while baking as it absorbs moisture. 5. Turn off heat. Add squash to sauce in pan and mix well seasoning with salt and pepper to taste. Transfer to 2 qt. casserole dish. Top with breadcrumbs and remaining 1 tsp sage (& Parmesan) mixture. Bake about 20-25 minutes. 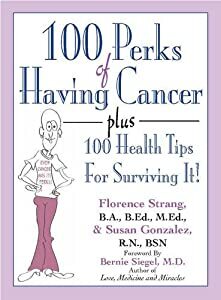 Please let me know how you liked it! 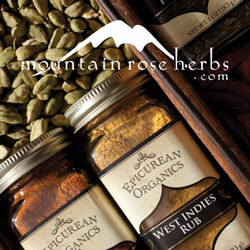 For great natural products click here. 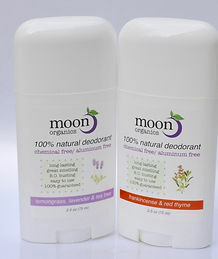 ‹ iWhat’s in your “naturally derived” hand soap?